Fragments of fifth-century clay figures shaped in human form have been found at a burial mound here -- the oldest such figures ever discovered in Japan, according to local officials. The terra-cotta "haniwa" figures are presumed to have been made for ritual use and buried with the dead in ancient Japan. The six figures were unearthed from the Ishiya burial mound in the Shimane Prefecture capital of Matsue, local board of education officials said on March 8. Two of the six figures depict sumo wrestlers, two are in the form of warriors, and one depicts the chair portion of a seated human. Archeologists believe the remaining one may depict an aristocrat. One of the sumo wrestling figures shows the lower part of a human body dressed in a loincloth with spiny weapons attached to the ankles. The height of the complete figure is estimated to have been approximately 110 to 120 centimeters. According to officials, although several other ancient human-shaped haniwa parts, including a shrine maiden's head, were previously discovered at the Daisenryo (Emperor Nintoku) mound in Sakai, Osaka Prefecture, this is the first time that haniwa in the form of wrestlers, warriors and a seated person have been ever found in Japan. Archeologists believe that the use of human-shaped haniwa sets began around the fifth century -- about the same period that the recently discovered haniwa are presumed to date from -- at large keyhole-shaped mounds in the southern-central Kinki region of Japan, which includes Osaka, Kyoto, Nara, and other prefectures. "This is a major discovery, because it shows that the Yamato rulers at the time had close ties to powerful clans in the Izumo region (modern day Shimane Prefecture)," says Katsuhisa Takahashi, a professor of archeology at Hanazono University in Kyoto Prefecture. 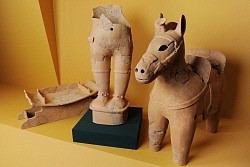 Along with the six human-form haniwa, archeologists further discovered two horse figures, also presumed to be among the oldest of their kind in Japan. During a major 1978 excavation at the Ishiya mound in Matsue, archeologists discovered a large quantity of other haniwa fragments. The recent discovery comes as the Shimane Museum of Ancient Izumo reorganizes its collection of the ancient figures ahead of an exhibition in Kyoto this summer. The haniwa will be on display at Shimane Prefecture's Yakumotatsu-Fudokinooka Museum from March 10 to 20, and at the Shimane Museum of Ancient Izumo between March 22 and May 21.